Notiication has been received with the passing of DL pilot Captain Denis ‘Denny’ Fullerton Waldron, age 66. Captain Waldron joined Delta Air Lines 08-22-1977 and was based ATL/030. Captain Waldron’s obituary notes: “Denny’s life will be celebrated on Wednesday, December 10th beginning at 9:30 am EST with a memorial service at the Darby Funeral Home in Canton, Georgia followed by interment at the Georgia National Cemetery at 11:30 am.” He is survived by his wife Rosalyn. Denis “Denny” Fullerton Waldron died on December 6, 2014 at his home in Waleska, GA at the age of 66. He is survived by his wife, Rosalyn Ramage Waldron; daughters, Leah Courtney Maczik (Joe) and Whitney Waldron Muyres; son, Denis Graham “Gray” Waldron (Jordan); brother, Jonathan Waldron; and his four grandchildren, Alexander Andre Michniewicz, Jaxon Gray Muyres, Jadyn Belle Muyres, and Tillman Garrison Waldron, who knew him as “Grandenny”. He is also survived by many loving nieces and nephews. Denny was born January 28, 1948 in Summit, NJ to John and Leah Waldron, who predeceased him. He also is predeceased by his younger brother, Peter Wood Waldron. He was raised in his beloved hometown, Mountain Lakes, NJ, and graduated from Mountain Lakes High School, class of 1966. Thereafter, he attended North Carolina State University where he earned a degree in Materials Engineering in 1970. His career started with the U.S. Navy where he served as Aircraft/Mission Commander, Standards Evaluator, and Nuclear Weapons Officer. Over his six years of service, he flew the P3 Anti-submarine and was deployed to the Azores, Spain, Sicily, Crete, and Iceland. As a member of Squadron VP-45, based in Jacksonville, FL, he met Rosalyn and they were married on December 20, 1975. After working towards earning a MBA at the University of Florida, he was hired by Delta Air Lines in 1977, and they relocated to Marietta, GA. In 2004, the couple moved to their piece of paradise on Lake Arrowhead in Waleska, GA.
Denny was a commercial airline pilot for Delta Air Lines for twenty-seven years with type ratings on the MD-88, B-757, B-767, and B-777. In 2005, he retired from Delta and was hired by Asiana Air Lines as an Expat Captain. He and Rosalyn lived in Seoul, Korea for two years while he flew the B-777 to China, Thailand, Saipan, Vietnam, Australia, India, Europe, and U.S. cities on the west coast. 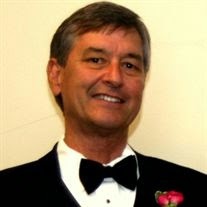 Denny was an adventurous and driven professional with a great sense of humor who deeply loved his family and friends. He was diagnosed with melanoma in 2005. He had surgery and participated in a clinical trial at Moffitt Cancer Center in Tampa, FL. He remained cancer free for seven years before the melanoma aggressively returned. Even throughout his final months, he remained brave and continued to put his family first. He lived a very rich life, enjoying many activities such as tennis, softball, skiing, boating, and traveling the world. Denny Waldron will be sorely missed by all who had the privilege of knowing him. Denny’s life will be celebrated on Wednesday, December 10th beginning at 9:30 am EST with a memorial service at the Darby Funeral Home in Canton, Georgia followed by interment at the Georgia National Cemetery at 11:30 am. In lieu of flowers, donations can be made to “In Their Honor Transports” at 501 Rabun Court, Canton, GA 30115. The family thanks Dr. Kudchadkar of Emory Winship Cancer Institute and Transitions Hospice for their compassionate, attentive treatment. The caring staff of Darby Funeral Home is in charge of arrangements.